Marle is one of our most mild mannered alpaca, with a very sweet and gentle disposition, in spite of his very large size. A joy to handle, he is very willing on the lead. He is terrific with the public, very outgoing, and would make a terrific pet, or companion male. His fleece is quite lustrous, and silky soft. He even took a blue ribbon in his day! Yarn from his fleece is available at our farm store. (Sorry, Sold out.. more coming soon!) Soon you can make your Marle sweater! Marle scarves are available for sale. Marle would be best purchased and paired with one or two of his pals. 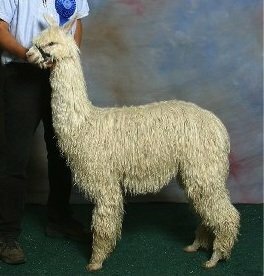 Please inquire about our generous multiple pet-alpaca discount.